Are you new to the story of Bishoujo Senshi Sailormoon? Do you want to learn more about it before you try reading up on the characters and the show itself? Well, you're in luck. This page is here to give you some insight into the history of Bishoujo Senshi Sailormoon, both the manga and the anime. Enjoy! Manga is the term used by the Japanese to refer to comic books. Stories are usually released weekly, sometimes in magazine publications, which are later collected into volumes called tankouban. They are in black-and-white since publishing in color is very expensive. Characters in manga usually have very large, round eyes (usually just the females, however), hair colors of all shades of the rainbow, and unusual proportions (skinny necks, loooong legs, very tall, etc.). Speed lines are used a lot to indicate motion. Backgrounds are usually very detailed compared to the characters. Mecha (think big robotic stuff) are commonly featured, as well as people with super powers, gushy romances, evil villains, typical fantasy material. Many stories fall into either the shoujo or the shonen category -- shoujo being aimed at girls and shonen at boys. 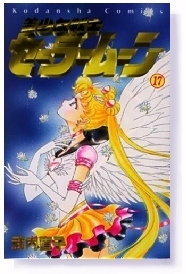 A woman named Naoko Takeuchi published a manga in 1991 called Codename wa Sailor V (or Codename Sailor V), released in the summer edition of Run-Run, a sister publication to Nakayoshi. It was a shoujo story featuring a girl named Minako Aino who could magically transform into a super heroine, Sailor V. She had a talking cat named Artemis, and he had a gold crescent moon on his forehead. It became so popular that she created Bishoujo Senshi Sailormoon, which began its run in the February 1992 issue of Nakayoshi. Bishoujo Senshi Sailormoon is a story about a girl named Usagi Tsukino who finds a talking cat named Luna on the way to school. Luna had a crescent moon on her forehead as well. Luna later tells Usagi she can transform into a super heroine named Sailormoon. Along the way, she is joined by Ami Mizuno, who is Sailormercury; Rei Hino, who is Sailormars; and Makoto Kino, who is Sailorjupiter. There is also a mysterious man named Tuxedo Kamen that comes to their aid during battles, who is actually Mamoru Chiba. They battle together against the Dark Kingdom, led by Queen Beryl. They find out later when Minako Aino appears as Sailorvenus that they are all reincarnations of their previous selves from the Silver Millennium, which ended a thousand years ago. Usagi was the moon princess, Serenity, with the others as her guardian Sailor Senshi (Sailor Soldiers). Mamoru was her lover, Prince Endymion. These first five are known as the Inner Senshi. Following the defeat of the Dark Kingdom, they continued facing villains, such as the Black Moon Family which came from their future, the Death Busters, the Dead Moon Circus, and Sailorgalaxia, with her henchmen the Animamates. In the future, Usagi and Mamoru have a daughter nicknamed Chibi-Usa, who comes to the past, who is the Senshi-in-training Sailorchibimoon. They are also joined by other Sailor Senshi later on. The Outer Senshi consist of Setsuna Meiou, who is Sailorpluto; Haruka Ten'ou, who is Sailoruranus; her lover Michiru Kaiou, who is Sailorneptune; and Hotaru Tomoe, who is Sailorsaturn. The Starlights and their princess from from another galaxy, and they consist of Kou Seiya, who is Sailorstarfighter; Kou Yaten, who is Sailorstarhealer; and Kou Taiki, who is Sailorstarmaker. These three pose as males in a band called the Three Lights, but are not, and share the same first name. Their princess is Princess Kakyuu, who is Sailorkakyuu. Usagi has a fighting spirit called Sailorcosmos, which first appears as a young girl, Chibi-Chibi, who becomes Sailorchibichibimoon. Galaxia and the Animemates are also considered Sailor Senshi. A total of 18 tankouban were released in Japan. Some of these have been translated into other languages, including some Chinese dialects, French, and English. Anime is the term used by the Japanese to refer to animation. It features many of the same elements that manga has, except animated and in color, of course. Anime are shown as television series, television specials, made as direct-to-video series (OAV or OVA, meaning original animation video and original video animation, respectively), and/or released as a movie. The anime of Bishoujo Senshi Sailormoon started airing March 7, 1992. The storylines and characters of the manga were pretty much kept the same, however there were some differences. Princess Kakyuu is never shown as a Senshi. Chibi-Chibi is never shown as Sailorcosmos, and her origin is different. The Starlights are female, but in their "civilian form," they are male. Many of the Animamates never appear. Since the anime couldn't put out episodes until the manga had, there were many filler episodes, even a whole story arc that never existed in the manga. Many minor characters had larger roles than they did in the manga for the same reason. Some changes were made to the characters' personalities and occasionally their appearance [Rei, Hotaru, and Haruka's hair color, for instance], the violence isn't as bad, and the stories are overall a bit tamer than the manga. Three movies were made; the first and third being original stories, the second based on volume 11 of the manga. None of these movies fit into continuity, however. The final episode aired on February 8, 1997, almost five years after the first episode aired. Some of anime has been "translated" into many languages, including Cantonese, Portugese, Spanish, Tagalog, Italian, and English. Most of the time, these would more accurately be called versions of the story since the dialogue is changed, episodes are removed, some scenes aren't shown, violence removed, even the gender of some characters and their relationships changed. Some versions have the villains Zoisite and FishEye as female because of their homosexuality, and Haruka and Michiru's relationship is changed. The Starlights are "twin sisters" to the Three Lights. Whole episodes aren't shown for slightly lecherous content and death scenes are usually editted or completely removed. Violence is toned down greatly.